New advice from British medical officers warned regular drinking increases the risk of developing cancer. GUIDELINES FOR ALCOHOL intake for men have been slashed by a third in new advice issued by Britain’s chief medical officers today. Men are now being told they should drink only 14 units of alcohol per week, the same as for women and down from the previous level of 21 units. One unit is roughly equivalent to a small glass of wine or a small shot of spirits. The advice, the first update of its kind for 20 years, also says people should take several days off drinking every week. 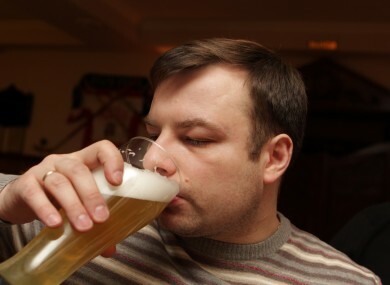 It warns that regularly drinking any amount of alcohol increases the risk of developing cancer. Pregnant women are now being told they should avoid drinking alcohol completely. Previously, they were advised to limit themselves to only drink one or two units once or twice a week. “What we are aiming to do with these guidelines is give the public the latest and most up to date scientific information so that they can make informed decisions about their own drinking and the level of risk they are prepared to take,” said Sally Davies, the chief medical officer for England. Officials say the full extent of the correlation between alcohol and cancer was not properly understood when the previous public health guidelines were issued in 1995. Britain has a higher than average level of alcohol consumption, according to figures from the Organisation for Economic Development and Cooperation (OECD) group of rich nations. The charity Alcohol Concern says that more than nine million people in England drink more than the recommended daily limit out of a population of around 54 million. It adds there were nearly 6,500 alcohol-related deaths in England in 2012. There is fierce debate in Britain over whether to bring in a minimum price for alcohol, in a bid to get rid of the cheapest drinks and discourage alcohol abuse. Only the devolved government in Scotland has so far introduced legislation to impose this. Email “Men told to limit themselves to six pints a week”. Feedback on “Men told to limit themselves to six pints a week”.